"Lips red as blood, hair black as night, bring me your heart, my dear, dear Snow White." A stunt war hammer from the production of the new twist on the classic tale Snow White and the Huntsman (2012). Pursued by the evil sorceress Queen Ravenna (Charlize Theron) for her heart, young princess Snow White (Kristen Stewart) flees into the Dark Forest. Out of options, the Queen sends the widowed huntsman Eric (Chris Hemsworth) after her, not realising he would help bring about her downfall. This war hammer and others like it were carried by soldiers in Duke Hammond’s (Vincent Regan) army as they invaded Queen Ravenna’s castle under the command of Snow White. The head and handle of the axe are made of rubber with a metal armature to add weight and rigidity. 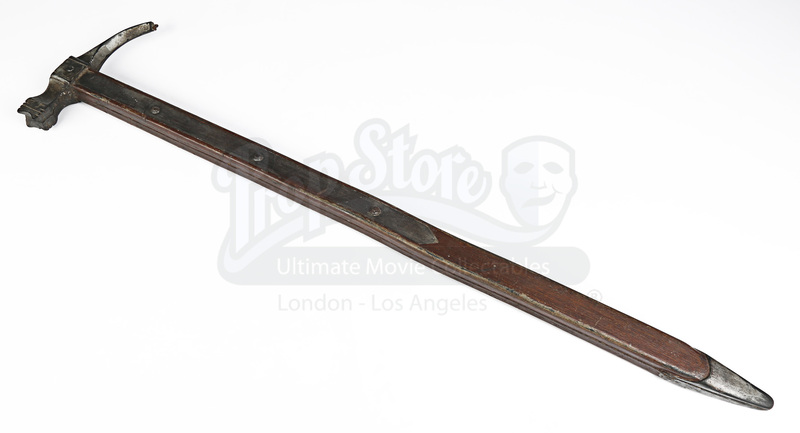 Expertly painted to replicate wood, the top half of the handle displays a ‘metal’ inlay piece with faux rivet detailing and the end of the handle is pointed. The head has been painted in varying faux silver shades to create the appearance of worn metal. The piece has been intentionally distressed to produce an aged appearance. 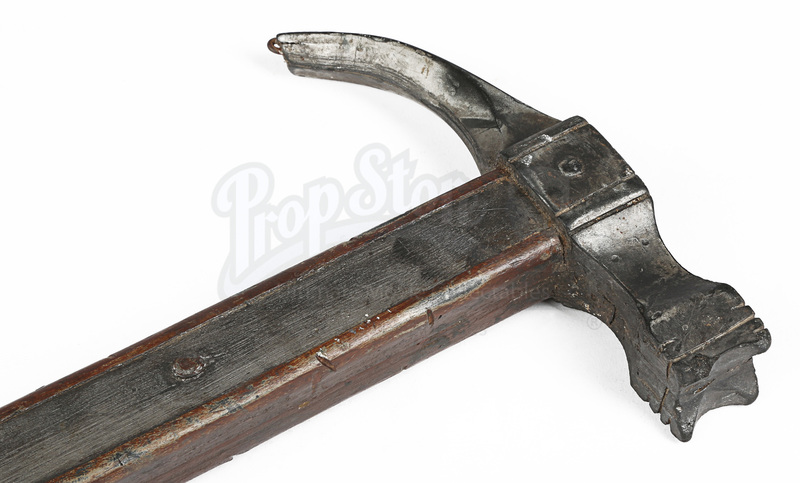 Silver paint marks are present on the handle and the end of the curved section of the hammer head has worn away, exposing the metal armature. However, despite this wear the piece remains in very good condition.